Try this activity while walking or when you stop for a break. Depending on the age of your kids, challenge them to find different things. Spice up the scavenger hunt by setting a time limit or limit the area to the ground or eye level. If you were a Girl Scout or Boy Scout, dig into your repertoire of camp songs. Preschool songs with their repetition and rhythmic beat work well, too. Birding by Ear is a fantastic CD compilation I’ve used to teach my kids common bird songs for our area. Birding by Ear uses phonetics, mnemonics, and descriptive words to help listeners remember bird calls. Learn a few before going out on your nature walk and see who can identify the most bird songs and calls. Look online before you go out and see if there is a letter box or geocache site set up in the area where you will be walk. Bring along your supplies for finding the letter box or geocache site. While taking a water or snack break, play charades using the behavior of animals and birds you saw on your walk. Have each kid take turns being a navigator using a map and a compass. 9. Pick a Letter and find things around you that start with the letter sound. 10. 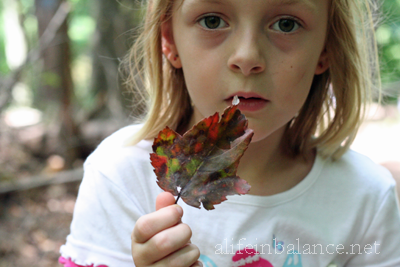 Find Letter Shapes in Natural Objects around you. What are your favorite outdoor activities for your kids? Weekly Newsletter: Get a free list of 100 Outdoor Adventures for Kids! That’s a nice list of things to do with various ages of kids in the out of doors. 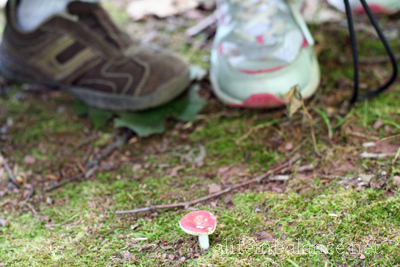 We usually didn’t plan extra activities with my kids when we went for walks in the woods. If they found a stick, they were happy for the rest of the trip. Although, I always made sure that they knew what poison ivy looked like. Great list We love taking nature walks and will add some of these in to make it more fun for the grandkids! Kristina & Millie recently posted..Snickerdoodle Sunday with Bobbi from 3glol! We like geocaching. Lots of fun! We haven’t done a scavenger hunt yet, that sounds like a great idea too, we will have to try it out. Thanks for linking up to Snickerdoodle Sunday. Kristina and Millie recently posted..Blurb Summer Sale – Make a book! Do you use your phone for Geocaching? I was discussing this with my Girl Scout coleaders on Monday night as a possible activity for our troop. We think there’s 2 geocaches near our meeting place. Yes, there are some iphone apps specifically for geocaching. they help a lot with finding the places. I get lost easy, haha. I love these ideas! We take my grandson for walks all the time and these ideas will keep him busy! This was a great post with lots of ideas and learning activities for kids. I shared it. Thanks for linking to the Bloggers Brags Pinterest Party! Fabulous list! I’m contributing nature posts to Pocket Mouse Publishing — their first book called Hunting Red fits with #1 perfectly! What fun ideas! We have a great nature center that has different levels of trails you can choose from and then another one that has a waterfall – we’ll have to make our walks more fun! I thought just walking and talking and telling jokes was good enough! Thank you for linking up at the Simply Sundays Link party! Oh, I wish we had a waterfall near us. Such fun! We love nature walks. Thanks for linking up to the Bloggers Brags Pinterest Party. I have pinned to the Bloggers Brags Broad.